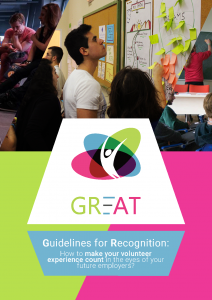 Guidelines for Recognition: How to make your volunteer experience count in the eyes of your future employers? Volunteering and youth organisations offer young people the platform for alternative methods of learning, complementing their experiences with formal education and helping to bridge the gap between education and employment. With the challenges nowadays world is facing, most of the sectors in the society are in need of new approaches and adaptations. Within that learning clearly has to reflect the needs and necessities of society for better employment opportunities and the needs of the learner for enhanced personal growth. If you want to provide your members with a quality learning experience and by that open up a new dimension for self-development and growth. Share the post "GR-EAT Guidelines"